The 2019 CAR WRENCHING SEASON HAS BEGUN. REPLACING THE CV-JOINTS AND AXLES OF MY 1978 ELDORADO | Geralds 1958 Cadillac Eldorado Seville, 1967 Cadillac Deville,1967 Cadillac Eldorado, 1971 Lincoln Continental Mark III and 1978 Cadillac Eldorado Biarritz. Starting in October 2018, I took a longer break from wrenching on my cars. I was just not motivated enough to work in the cold garage during the long winter months. But now with spring approaching fast and the car season only a few weeks away, I had to start finishing some projects waiting for me inside my garage. I decided to not replace the boots as it is rather complicated to do, but go for new axles instead which are not much more expensive than new rubber boots alone. 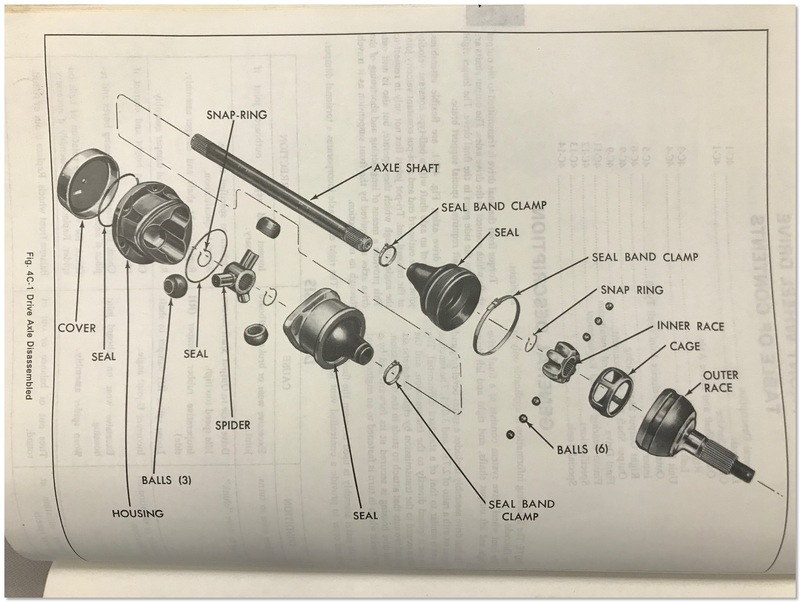 After all the tools and parts had arrived I completely did the driver side axle on the 1978 Eldorado in October 2017 as per the instructions in the shop manual. The most annoying and complicated part was to get the upper control arm detached from the steering knuckle. The replacement axles I bought are slightly different as the inboard mounting area is slightly slimmer - I also had to use an additional washer at the axle nut on the driver side axle, otherwise the cotter pin wouldn’t have worked. I also had to use additional washers at the inner end of the left axle as the original bolts would have been slightly too long for the new axle, and without the washers the bolt ends would have hit something... thanks to my friend Richard Vobr for helping me out with washers! Today I did the passenger side axle. 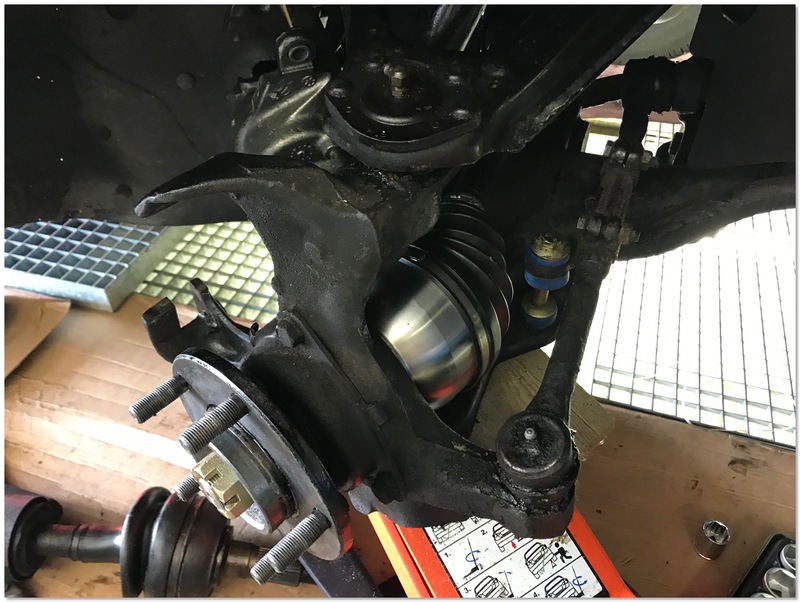 I tried to do it exactly like it was described in the shop manual, but due to the original rubber dampener on the right axle it was impossible to remove the axle. It doesn’t work as described in the shop manual as in 1978 they added these rubber dampeners to the right axle. It's so thick that it wont just slip out and could be pushed away enough to get the output shaft out of the car . 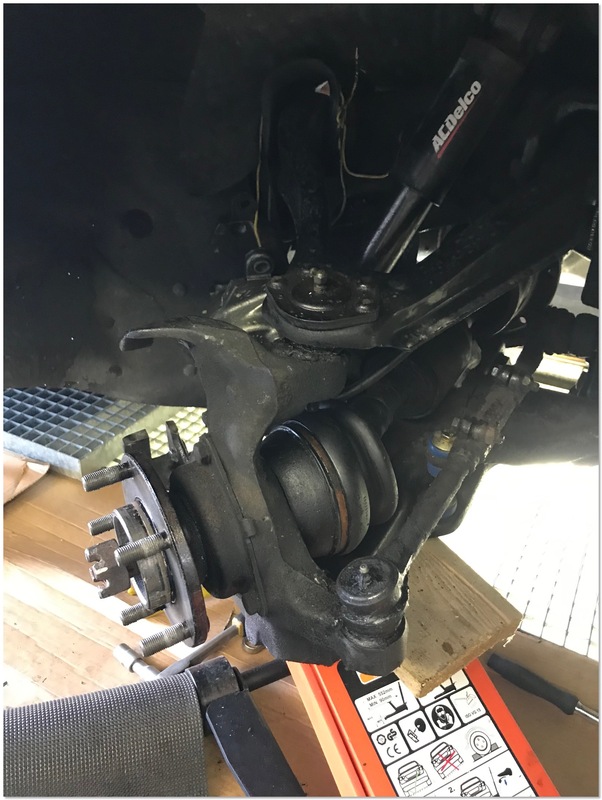 I had to disconnect the upper control arm from the steering knuckle to get more clearance but I could not get the ball joint on the upper arm loose with the tools I had. As I did not have the necessary tools to proceed, I desperately called my local mechanic what to do and he immediately agreed to come over to have a look and help me. With his help we got the upper control arm detached with a giant breaker bar he had brought along. Then I got the output shaft out and the new axle just slid in 🙂 no problem without the dampener! 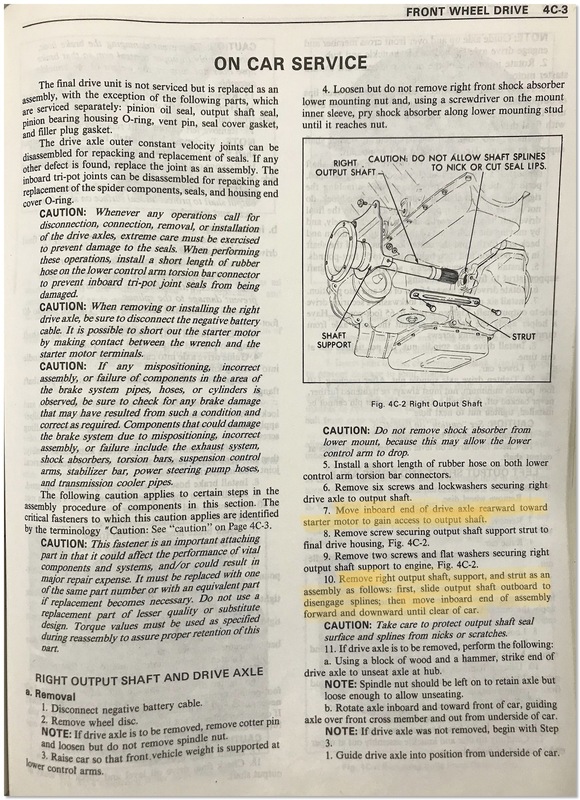 Below you can find the instructions from the shop manual - as mentioned before Step 7 and 10 (marked yellow) did not work for me and I additionally had to remove the upper control arm on the right side to get enough clearance to remove the output shaft. 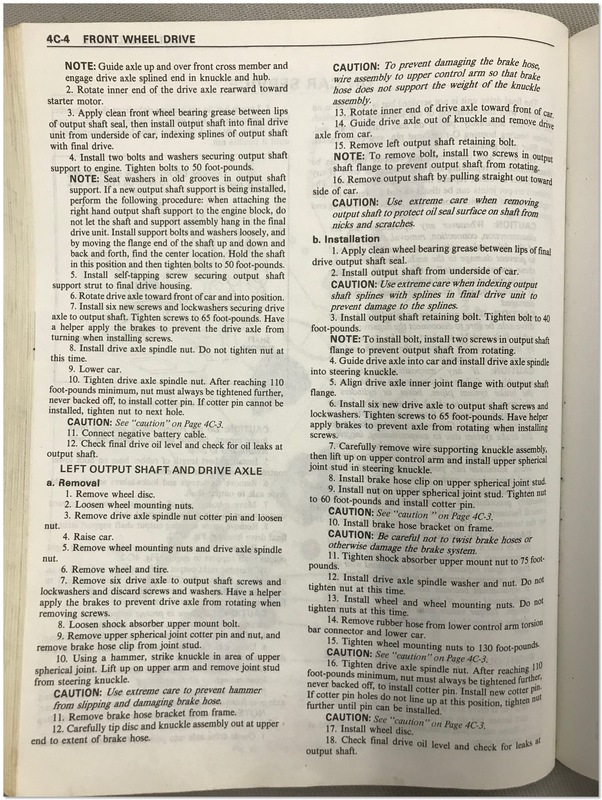 If you already have a replacement axle in your car without a dampener it will work exactly as described in the shop manual. 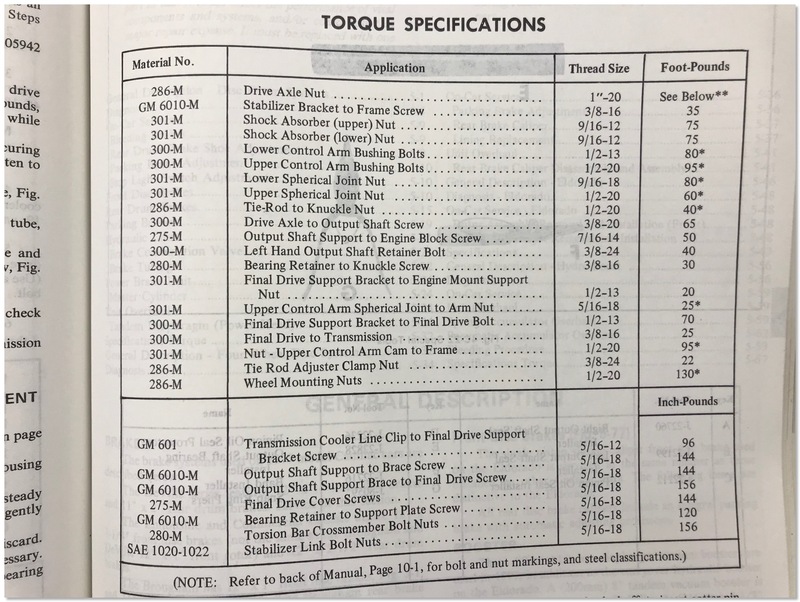 Make sure to torque everything to specs as listed below! 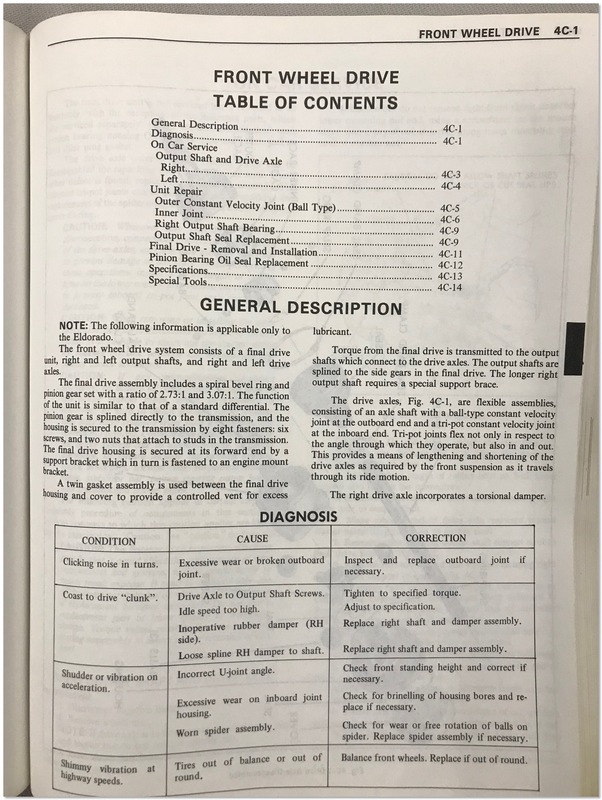 Step 7 and 10 (marked in yellow) did not work for me - I also had to detach the upper control arm from the steering knuckle like it is described for the left axle. The original axle and rubber boot still in place. This is what Cadillac installed originally into the 1978 Cadillac Eldorado on the right side. The rubber dampener was used to minimize torque steer. 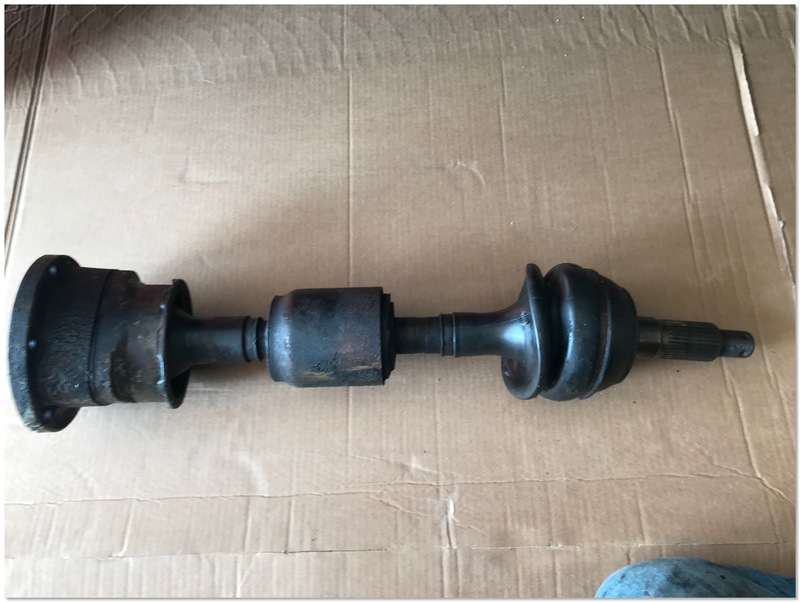 Replacement axles do come without any dampener. Also note the different rubber boot design compared to modern replacements which use boots with 5 ribs.